Larger backyards are also being broken up into outdoor rooms by designing the backyard into areas that have their own use or activity. These open rooms are then designed to flow together to create an overall backyard. A secret garden, kitchen room, children’s fort play area, and a water feature area are only a few rooms that are being created for. Plants are still part of this new outdoor living space but home gardeners are shifting to different garden styles. They are selecting plants that remind them of exotic places or a vacation destination that may be out of their reach at the time. Sophisticated contemporary designs are also in this year. Gigantic planters planted with bold plants, trees and pampas grass are focal points in the backyard and use of strong lines and angles fill out the landscape. Gardens are also being created smaller with better planning for space and use. This trend had to do with creating gardens with less work and also creating space for the return of victory gardens and recession gardens. Many of the most successful small space gardens are combining ornamental plants with vegetables and fruits. Petite annuals, perennials, shrubs and garden produce make combining these plants successful. And finally “green gardening” techniques are a main concern when designing the backyard. This includes planning the backyard around recycled building materials, recycled garden décor, and the use of no chemicals or softer pesticides. Controlling the amount of water used in the backyard is also important as is creating garden designs using solar lighting. With the changes in gardening and design even the city dweller or renter should be able to create there our backyard oasis, even if it’s only the size of a postage stamp. 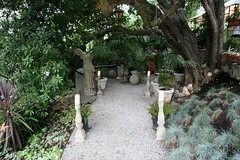 It amazing how beautiful and relaxing these small space garden areas can be. The Backyard Oasis, which is a site for The Gardener’s Rake is have a week long Small Backyard Design Week starting April 19, 2009. Stop by the Backyard Oasis for unique backyard garden design ideas that will focus on small space design, garden rooms, combining indoor and outdoor space and many other creative gardening ideas.